Thanks for posting this information. I noticed one anomaly in the text on the picture (album cover, I guess) that says “…both (Rafi and Madan Mohan) passed away early in their careers…”. This is not correct as Rafi and Madan Mohan had been active in the Hindi film industry for almost 35 years and 25 years respectively at the time of their demise. In 1975, Madan Mohan was still brilliant and in 1980, Rafi-saab still retained much of the charm from his earlier years. Surviving at or near the top for that many years in the fiercely competitive Hindi film industry of the 1950s through the 70s was an enormous feat. They definitely and very unfortunately had an untimely death, well below the average human life expectancy, but, mentioning 25 and 35 years’ innings as ‘early careers’ is in a sense pejorative to the stature of these artistes. I am very thankful to you for giving the information of two unreleased song of rafi saheb with veteran muusician Madan Mohan saheb. I also thankful to u also on the information about Bhopal’ Beghum & Hindi cinema. Although Madan mohan ji was one of the best music composer but bollywood unnotoced him always. In his last time he asked for work to producer &dirctors. his last movie Laila majnu has a special place in hindi cinema. I like also jehanara, sahrabi, anpadh, mera saya, ghazal,& parwana composition. I heard that composer Jaidev gave final touch of laila majnu’s compositin after his death. 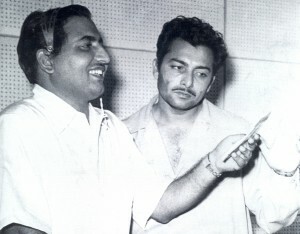 I m alltime gr8 admirer of Mohd.Rafi Madan Mohan duo. They are the real gem who have left a unforgetable stock of heavenly melody which will remain alive in the hearts of music lovers till quayamat.My heartfelt emotions always feel grateful for these mastresos for their all time favourite melodies.